This post was sponsored by P&G as part of an Influencer Activation for Influence Central. I received complimentary products to facilitate my review. Thanks for the fun! 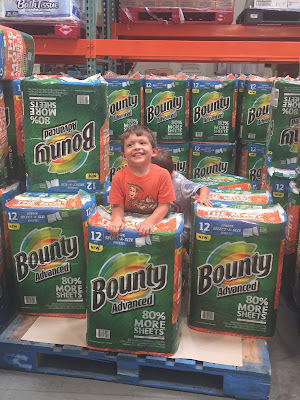 Like most families, we seem to head to Costco weekly to buy milk, eggs and everyday P&G Household Needs products from Costco. I'm also grateful that all the shopping carts at Costco allow for two children to ride up front, without having to search for an extra-large wagon type cart like we have to do at other stores. As a mom of multiples, this makes my life so much easier. Speaking of making life easier, I'm all about life hacks, especially when it comes to cleaning, which is my least favorite part of adulthood. We long ago ditched our mop for a Swiffer WetJet. I don't know about your kiddos, but mine like to mimic adults. Early on I noticed that when I would vacuum, they would go grab their toy vacuum and pretend to clean up behind me. Same thing when I would use a broom. This got me thinking...instead of pretending to clean with me, why not actually have them help more. 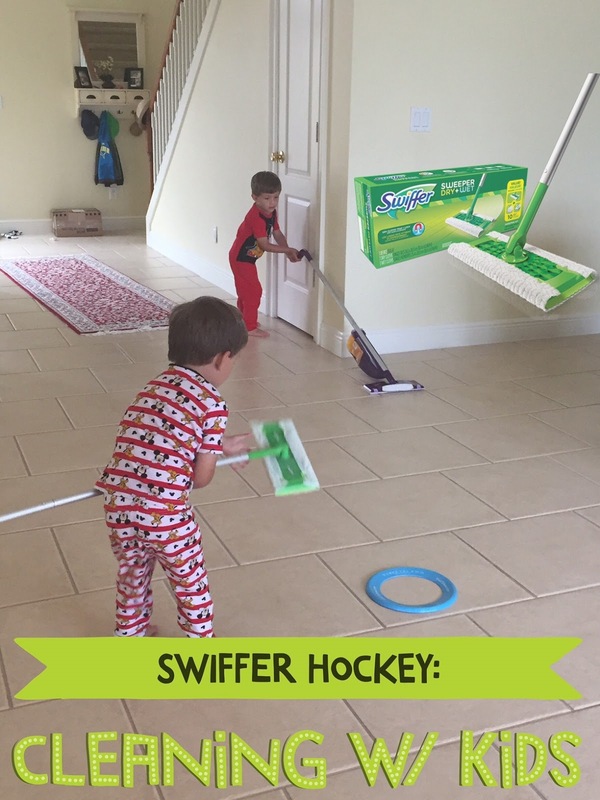 Thus, Swiffer Hockey was invented for added Sunday fun in our household. Frisbee or if you're in a bind you can use a soda cap or other puck-like material. Net or some sort of goal. You could even use the legs of a chair. I think you can see where I am going with this. 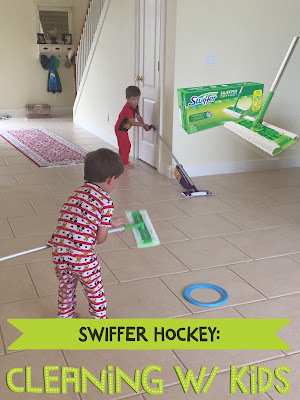 Start in one area of your floor, arm your kids with Swiffer Sweepers and accompanying pad for hockey sticks, throw down a Frisbee, set up a goal and get out of the way. Remember to keep moving the goal around so they can cover more ground. It's a win-win -- they have fun, while also helping to clean. Skeptical? You'd be surprised what these pads can pick up, even after you already swept or cleaned. Designed with thick, dirt grabbing ridges and grooves the Swiffer Sweeper dry pads grabs dirt, dust AND hair! We have two cats, so this is especially helpful when they are shedding. Swiffer Sweeper Dry Pad Refills have 3X the cleaning action (common inanimate allergens from cat and dog dander and dust mite matter) and are safe on wood floors, tile, laminate, concrete. So, while they are busy going after the puck, they are also collecting dirt, dust and hair. Meanwhile, Swiffer Sweeper Wet Mopping Pad Refills are loaded with thirsty little dirt-dissolving cleaners to pull away dirt and grime effortlessly while gliding across your floors. Like P&G's campaign, "details matter" especially to kids, so whenever possible, make cleanup fun. Thus, the hockey example above. Take your children shopping with you for cleaning supplies. 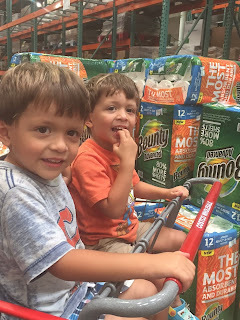 During our Costco run my boys enjoyed helping to load supplies into the cart, making them more eager to use them later. Play the Clean Up Song or Whistle While You Work to make mundane toy pick-up and other cleaning choirs more fun for kids. Sing along too. This can also function as a timer or countdown for how long they need to be putting away their stuff before the song stops. If you have more than one child. Make it a friendly competition. Most children are much more willing to participate in a game of “Who can clean up the most toys before the three minute timer goes off? Make it a scavenger hunt. For instance, first pick up everything that is red, then anything with wheels -- you get the idea. This turns clean-up into a game of hide and seek and can also help with teaching colors and shapes too. Purchase toys that mimic cleaning role play - we have a toy vacuum that makes sounds and small broom.